(01-09-00 ada) Until recently there's been no reason for Hungarian athletes to learn English. But in 1999 things began to change when a Hungarian basketball player signed for the Chicago Bulls and a Hungarian hockey player was picked in the NHL draft. Who knows?, the time could be near when a Hungarian returns home and says "The NHL? No big deal."? Two guys who are close to realizing this dream are Tamas Groschl and Levente Szuper. In 1999 the first Hungarian-born player in history was picked for the NHL entry draft. Then, a year later, it happened again! Their names are Tamás Gröschl and Levente Szuper. The Calgary-drafted Hungarian goalie Levente Szuper has joined the Flames on 28th August. He's had a good vacation and has got in some useful training to prepare for the camp. Szuper hopes to sign for Calgary and the club has said that there's a good chance the 20-year-old player will do. In the first season he'll probably be sent to their farm team, St. Johns, or to the OHL-team, the Ottawa 67's. Depending on his performance (nomen est omen) he might be given a chance in the NHL. But Levente was only the second Hungarian in the NHL. So who was the first? His name is Tamás Gröschl. Gröschl started out with Dajpest, longtime rivals of Szuper's FTC (the rivalry between the two clubs is comparable with that between football's Real Madrid and FC Barcelona). His first coach was Tibor Balogh, as was mine (Balogh was a goalkeeper with Ferencváros and is the man who brought women's hockey to Hungary. He was the head coach of the women's team and I was the goaltending consultant). Until his licence was stopped by the Edmonton Oilers in the ninth round last year, Gröschl was the first ever Hungarian-born NHL-drafted player. He was then sent to Sweden and played for the Leksand Stars. He played 33 games for Leksand's junior team and scored 29 points (15 goals, 14 assists) finishing 6th within the team. In the plus/minus list total he was 20th in the league with +23. He still has a good chance with the Oilers but if he's successful and they decide to play him in their farm team he said he would rather play in Finland. (06-07-00 ada) There has never been as much talk about Hungarian ice hockey as there has been recently. 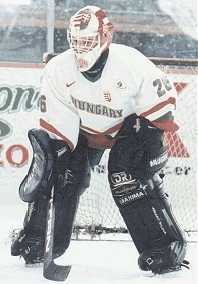 One of the main reasons for the excitement is Hungary's "Szuperstar" goaltender, Levente Szuper, who was taken by the Calgary Flames in the fourth round of the 2000 entry draft. A Hungarian in the NHL? Unheard of! Many newspapers in Europe have taken notice and mentioned Szuper in stories about the draft. However, there is more to Hungarian ice hockey than just one standout goalie. My name is Istvan Spiller, I work for the Hungarian News Agency and I am a former ice-hockey goalie. Mr. Kovacs, the general secretary of the Hungarian Federation, asked me to write about ice-hockey in my country. There are three leagues for adults, the first of them being The OB I. (premier division) which includes seven teams: Dunaferr, Alba Volan, FTC, Miskolc, Gyor, MAC and Szeged. There is another club, called Ujpest, which has financial problems and therefore abandoned its first team. In the second league the number of teams fluctuates depending on the local sponsors and citizens. If there is enough money, they play. There is no connection (promotion or relegation) between the two divisions. The third league is for the hobby/sportmen; this is the amateur league. There are many, many teams spread over the country (at least 20). I will speak primarily about the OB I. The 1998/99 season was for the Alba Volan. They were a very good team and won the gold medal after 20 years. The Hungarian Cup winner was Dunaferr. But in the last season, the Alba Volan went downhill. It's difficult to say what happened, but they were not able to reach the finals. The Dunaferr overcame their losses, and got to first place again. In the best-of-seven final they swept the FTC which has no indoor arena yet! The biggest problem with Hungarian ice-hockey is the lack of arenas. Only Dunaferr, Alba Volan and Szeged have indoor rinks due to lack of developement. The Dunaferr has the best circumstances. They have their own rink (not for the city), good trainers at the kadett and juniors, and a Slovakian coach, Julius Kovacs (ex Ambri-Piotta) for the adult team. Because of a need for competition, the Hungarian ice-hockey league tried to open towards Austria and Slovenia. Last season the three countries managed a co-league called Interleague. As expected, the Austrian teams dominated, but at the quarter-final, Dunaferr needed only one goal to reach the semifinal! Besides these accomplishments, the Hungarian national teams recorded one hundred-percent at the world-championships Pool-C in China in 2000 and were promoted to the world championships qualification round. There are two Hungarian young titans, who were drafted in the NHL. In 1999 the Edmonton Oilers selected Tomas Groschl (winger) in the last round (total 256. ), and he currently plays for the Leksand in the Sweden Elite League. And this year The Calgary Flames drafted the hero goalie, Levente Szuper, in the fourth round (116.)!!!! He is 20 and the most talented Hungarian ice-hockey player ever. He spent two seasons in Germany and played on the Krefeld junior team. After this he moved to Ottawa where he was the first goaltender of the Ottawa 67's in the OHL. And I have to comment about women's teams. There are three teams in Hungary, but only one is serious. They have many invitations from different countries - for example Slovakia. The women's national team plays under the Pool B. Summary: The Hungarian ice-hockey league would like to encourage competition with Western countries (as in politics and NOT toward Balkanian area), and is trying to organize a co-league with Austria, Slovenia, Croatia or Italy. Such a system would hopefully encourage development by everyone. We need more indoor arenas and ways to recruit more young players, etc. Ice-hockey is very popular in Hungary, especially when the football-season is over.